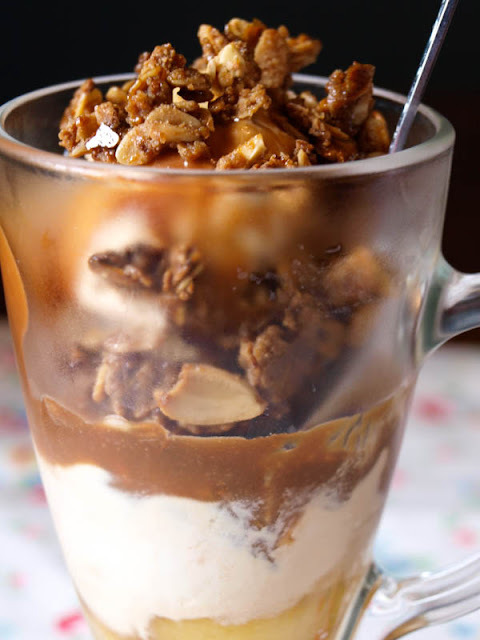 It's National Ice Cream Day on 19th July, there are so many different flavours of ice cream and different ways to serve it, but nothing beats a sundae on a hot day. There’s something magical that happens when ice cream and sauce and fruit and crunchy stuff come together. From classic fruit, nut and sauce combos, to more extravagant creations involving cookies, meringues and alcoholic sauces (for adults only! ), there are many delicious possibilities. Pre-heat the oven to 180C. Skin the peaches by covering with boiling water, removing after a couple of minutes and slip off the skins. Slice the peaches and place in an ovenproof tray, cover with the sugar and dot with butter. Bake in the oven for 10-15 minutes until the sugar and butter melts and the peaches start to brown and caramelise. Leave to cool, then lift the peaches from the caramel and Set both aside. Place two scoops of ice cream per person on tray or dish and place back into the freezer until ready to assemble the sundaes. Place all the ingredients in a small pan and gently heat, stirring, until the chocolate has melted and formed a sauce, you may need a little more water to get it to the correct consistency for pouring. Heat the oven to 180C. Place the butter in a frying pan and heat gently until the butter has melted add the granola, almonds and sugar, mix the dry ingredients with the butter stirring constantly for 2-3 minutes, then transfer to a baking tray and spread evenly. Place in the oven and bake for 5-6 minutes. Watch the Granola Crunch carefully as it burns quite quickly. Remove from the oven and leave to cool. Once cool, break up the mixture, it will keep well in a jar if you have any left over. Place the roasted peaches in the base of the sundae dish or bowl, top with two scoops of salted caramel ice cream, pour over the salted caramel sauce and sprinkle Caramelised Almond Granola Crunch over the sauce, eat and enjoy! While this is a really rich and luxurious Sundae, it does require a bit of time and preparation to make the various layers, if you want to create something much quicker, simply use fresh fruit without roasting, use a ready made Dessert Sauce like the new squeezable range from Clarks (the honey and maple syrup people) the sauces are made with carob syrup, a low calorie, low gi alternative to refined sugar, flavours include tempting chocolate and tantalising caramel, either of which would work well in this Sundae, as well as scrumptious strawberry. For a quick and easy topping, try chopped up fudge, fudge pieces or chocolate chips, or simply sprinkle over some granola without caramelising it. Looks lovely janice - I am a huge fan of salted caramel...in fact along with chocolate it is one of my biggest downfalls. So chocolate, caramel, peach and more...YUM! Oh my goodness Janice this looks amazing. Love the sound of the roasted peaches with the salted caramel, where's my spoon? Thanks Fiona, it was VERY good! Oooh, looks delicious. Love all that salted caramel and the peaches look luscious! This is beyond decadent and would love to have this out our bbq today. 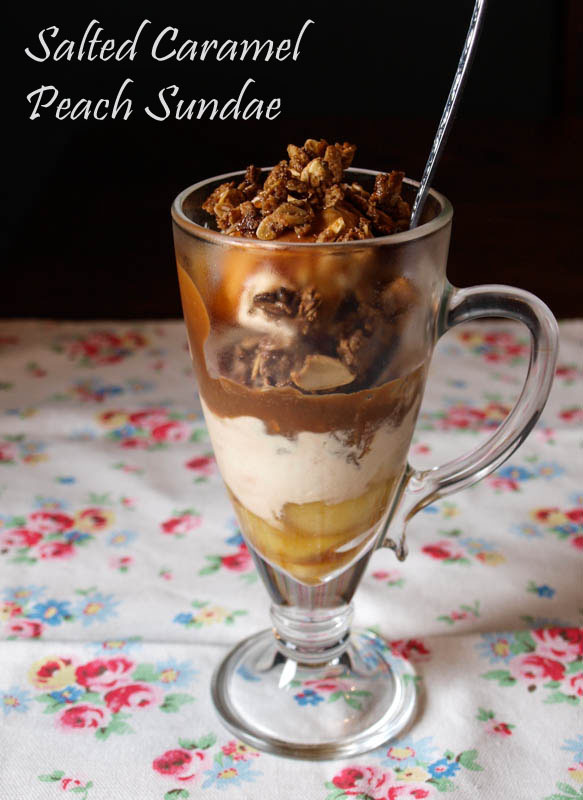 peach and salted caramel with chocolate... an unusual and brave combination but I TOTALLY get it and LOVE this idea. Plus it looks sensational! I want! Not going to lie you had me at salted caramel! Peaches and cream were just the icing on the cake! (Or the other ingredients in the sundae....) Fab recipe! It would be perfect at a BBQ, Bintu all the elements can be pre-prepared and put together at the last minute. Thanks Dom, we loved it. There is something awfully addictive about salted caramel, isn't there? Oh wow I love this flavour combination, I want to grab a spoon and dive right in! Oh this sounds HEAVENLY! Perfect for summer - such glorious flavours and textures! WOW! Total decadence!!! Love it!